My first runestone on Adelsö became a tombstone, or rather a runestone like tombstone, a rune-tomb-stone. Today's tombstones are usually poor on information with only name and date. In the past, they were more telling and more interesting. 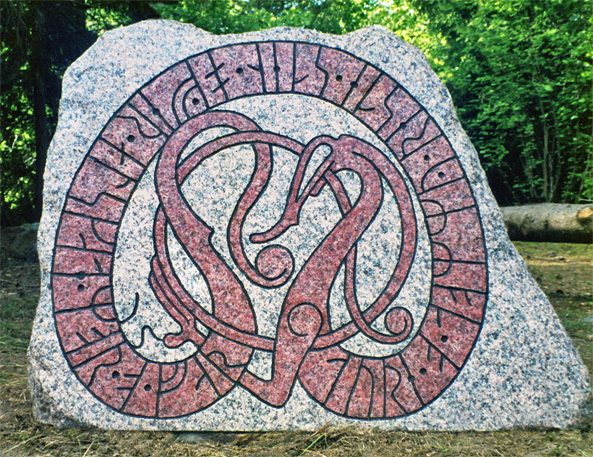 A rune stone as tombstone gives the opportunity to say a little more, and mean a little more. When the order was made, "mother" who was mentioned on the rune stone was still alive, she was there and said: Soon it is my turn and then I will be buried next to "father" so it is just as good you carve in "mother" already now. Inside the ornament, by the dragon's thumb, I have carved my signature / house mark.